Up:What am I doing? Drinking Mate! 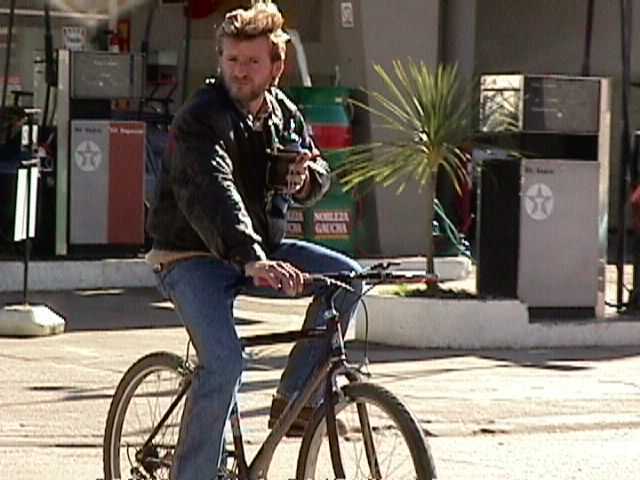 Down: In Uruguay, people drink mate even on the street or biking!! 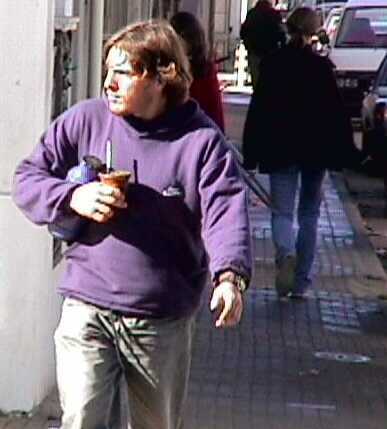 Mate is as tea like beverage consumed mainly in Argentina, Uruguay, Paraguay and southern Brazil. It is brewed from the dried leaves and stemlets of the perennial tree Ilex paraguarensis ("yerba mate"). 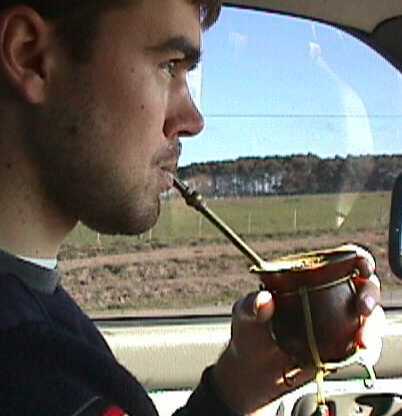 The name "mate" derives from the quechua word "mat�" that means cup or vessel used for drinking. The scientific name Ilex paraguarensis was given by the french naturalist and botanist Auguste de Saint Hilaire in 1822, the tree belongs to the family Aquifoliaceae and grows between the parallels 10� and 30� (South) in the Paran� and Paraguay rivers basins. It is a plant typical of the Alto Paran� region, Alto Uruguay region and the Argentine NE. It is a tropical or subtropical plant, needing high temperatures, high humidity and up to 1500 mm of annual rain. On average, 300,000 tons of mate are produced each year. In the wild, the plant needs about 25 years to develop completely, reaching in that case a height of up to 15 meters. The leaves are alternated, cuneiform, elliptical or oval, with the border slightly serrated. It flowers between the months of october and december. The flowers are small, polygamous, dioicous, with calyx and corolla in a tetrameric disposition. The fruit resembles a pepper berry. Among several varieties, there are three that are the most important: "angustifolia", "longifolia" and "latifolia". Mate has a characteristic mature flavor which is somewhat sweet, sour, withered leaf like, and cigarette-like, similar to that obtained from tea (Camellia sinensis)[Kawakami]. Of the 196 volatile chemical compounds found in yerba mate, 144 are also found in tea. The infusions of Ilex paraguarensis are less astringent than those made of tea. How To Prepare Yerba Mate The gauchos (South American Cowboys) fill the mat� (gourd) up to 2/3rds full of loose yerba leaves. This is a very strong preparation for the North American palette, so we suggest you start with a 1/4th gourd full to begin with. After filling to taste with yerba, place your bombilla (silver filtering straw) into the leaves. Nestle it into place. Next - pour in hot, but never-boiled water and fill the gourd to the top. It is important never to stir, as this plugs the filtering tip. The water will cause the leaves to swell and the water at the top of the gourd will look frothy and green. This means it is full of nutrients. You can refill the gourd time and time again (5-6 times) until the green froth is gone which means the leaves are 'lavado', depleted, and it is time to start fresh. Many South Americans like a sweetened mat� and to do that you can add honey or sugar to your hot water. We have found that yerba in combination with other herbs makes for a great taste and enhanced health. You get the best nutritional value from the yerba by using the bombilla straw, for the act of pulling the water across the leaves extracts the nutrients far more than if you were to drink yerba mat� via a teabag or other methods of extraction. For those of you who prefer cold tea - try yerba mat� as a sun tea. It is delicious. Set loose tea in water out in the sun and let it steep in the rays for awhile. Sweeten and serve over ice. It is magnificent, and seems to surpass the hot tea in energy and happiness-giving!! Yerba Mat� is best when served in community with friends, introduced to new acquaintances, made with fresh spring water, outdoors, by campfire and offered in a ritual of love and friendship for each other and our natural world. Even alone, you may find that you reach a deeper connection to self and others as you cup the mat� in your hand and taste the magic of it as the day begins.